Times Observer photo by Brian Ferry Some of the materials dissussed by officials who participated in a mass casualty incident training session Thursday at City of Warren Fire Department. 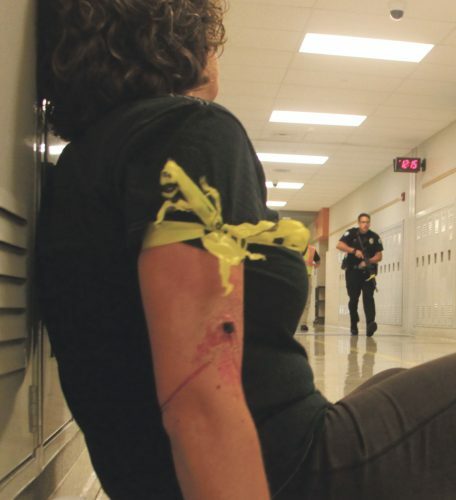 In an active shooter situation, like the one that will be simulated at Beaty-Warren Middle School on Tuesday, a coordinated, efficient emergency response could be key to saving lives. Local law enforcement officers have practiced their responses this summer and will do so again. But, their primary job is to end the threat. Other responders will have complicated, challenging, and possibly heart-breaking work to do. Officials from the City of Warren Fire Department hosted City of Warren Police Officer A.J. Foriska, Warren County School District officials — Superintendent Amy Stewart, Director of Curriculum, Instruction, and Assessment Rhonda Decker, Supervisor of Elementary Education Eric Mineweaser, and Quality Control Supervisor Boyd Freeborough — and Dr. Alaina Hunt of Every Day Responder, for a mass casualty incident (MCI) training on Thursday. Operations Training Officer Steve Hoffman led the training, which included specifics about the drill at Beaty and generalized information about MCIs. A mass casualty incident is one that involves a number of injuries or deaths beyond what can be routinely handled. There will be many agencies involved in any real MCI. Bringing some of those together for training will make things go smoother if there is ever a real incident. Hoffman said one of the keys to a successful response is the actions taken by the initial responders. He said the first several WFD firefighters on an MCI scene in the city will take the key roles and set the wheels of a large-scale response in motion, rather than trying to treat or transport a patient. Hoffman talked about the command structure and the key individual roles that will need to be taken. 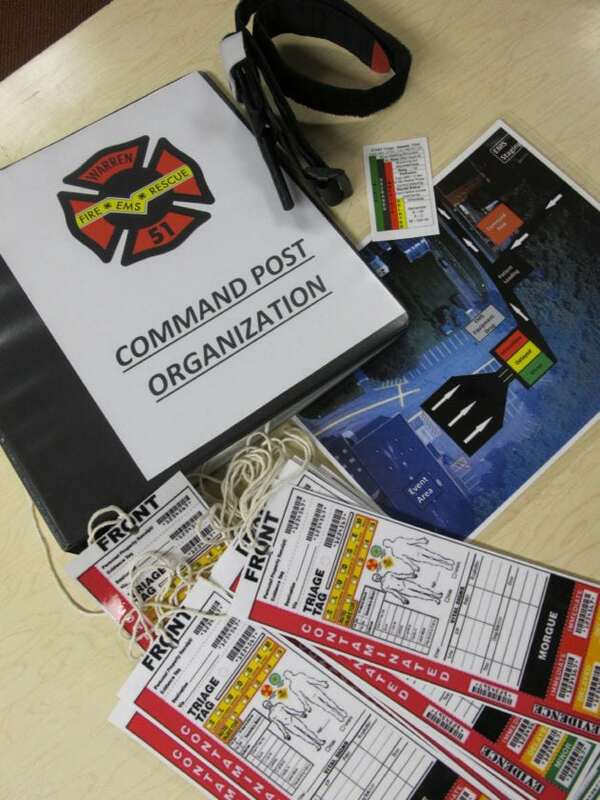 Key roles start with the incident commander. Fire department personnel would take on positions including medical officer, triage officer, and treatment officer. For the drill, Hoffman talked about where the department will set up its operations. He pulled up maps and photos that the district has made available to responding agencies. And he talked about the danger. No emergency medical services will enter the scene until responding law enforcement have downgraded the danger and provide some level of security for other responders. Initially, the first EMS personnel inside will make quick evaluations of each patient and move on. People who are trained to render aid will have to walk away from patients who are afraid, in pain, and in need of treatment to ensure that the maximum number of patients survive. There will also be a transportation officer and a public information officer. Hoffman said he hoped the district would provide the personnel for those positions and that they would be on site, with the incident commander, for the drill and in a real incident at a school. The district employs medical personnel at its buildings and Stewart asked if those people should seek out one of the officers at an incident scene to offer their help. “They are an asset in the right place,” Hoffman said. There would be roles for medical personnel to play, but, depending on their training, they would likely not be allowed to perform certain functions in an MCI, he said. Because Tuesday’s incident is a drill, responders will not have every asset at hand. Warren County 911 will not take an active role in the drill, so Hoffman had to work out a communications plan that will not tie up public systems. The ‘victims’ at the drill will not be transported to any medical facilities. Hoffman said the department will be ready to immediately respond to a real emergency should one arise during the drill and those other participating agencies will also be able to leave the scene quickly.